Kmart started airing television spots in September for the still-distant Christmas shopping season. In doing so, they’ve clinched a record for the earliest launch of the holiday shopping season yet. Every year, America’s biggest retailers have been inching the holiday shopping goalposts a little earlier into the fall. The previous record holder – from last year – was Target, which started airing ads on October 7th. Recession-strapped consumers have been spending less on holiday gifts each year since the 2008 financial crisis, and big-box retailers are desperate to keep their sales numbers from sagging. It seems they’ve found a perfect solution: if you can’t boost sales during the holiday season, just make that season twice as long. Problem solved! Tellingly, Kmart’s opening ads focus heavily on the retailer’s layaway service. 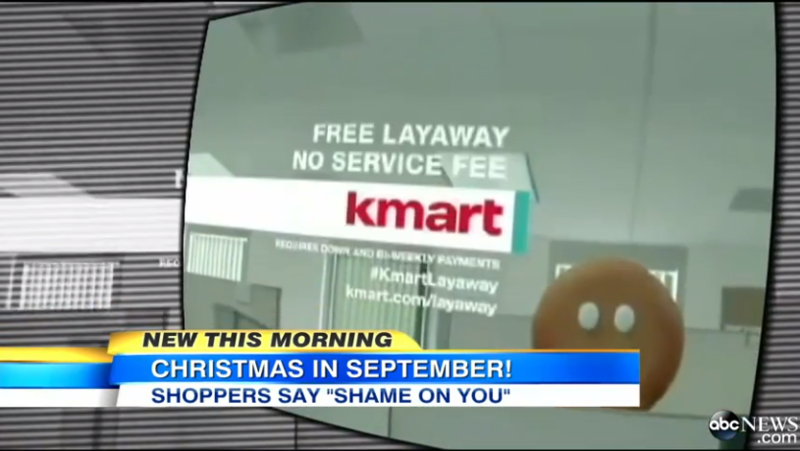 They’re also offering to waive service fees on all layaway purchases between now and November 23, which indicates that Kmart is eyeing the pocket books (and maxed out credit cards) or cash-strapped consumers hungry for deals, even if that means they’ll have to buy their Christmas presents before Halloween. Last year, Kmart’s first holiday ads appeared on Oct. 28th, so this is a brazen leap forward. Just a decade ago, it was common for people to gripe when the Christmas ads kicked in just before Thanksgiving. Now we’re hearing about holiday blowout sales while still recovering from our Labor Day food comas. At the rate things are going, it wouldn’t be shocking to see holiday ads pop up just after July 4th next year. So true. You have a way with words that i wish i had.